In its fourth year, the Readers’ Choice Awards highlight the cleanroom equipment and supplies that readers judge most effective and trusted in their work. Cleanroom equipment and product suppliers were invited to submit their products for these prestigious awards. Winners in each category were chosen based on a voting survey sent to a select group of Controlled Environments readers. 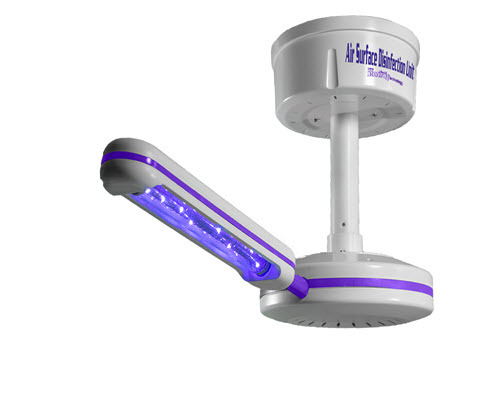 The Air-Surface Disinfection Unit from Far-UV Sterilray provides a high-level of pathogen disinfection in room air and surfaces with just the flick of a switch. Center-mounted, its rotating field of irradiance will kill microbes facing the lamp on surfaces: a run of 7 hours produces a greater than 6-log (99.9999 percent) kill on floor-level surfaces. It simultaneously disinfects air passing by a lamp with a 99.98 percent single-pass kill, including any pathogens entering the cleanroom from outside make-up air. One day it will be safe for human exposure. The light may offer low-cost solution to eradicating airborne viruses in indoor public spaces. Continuous low doses of light can kill airborne flu viruses without harming human tissues, according to a new study at the Center for Radiological Research at Columbia University Irving Medical Center (CUIMC). The findings suggest that use of the overhead light in hospitals, doctors’ offices, schools, airports, airplanes, and other public spaces could provide a powerful check on seasonal influenza epidemics, as well as influenza pandemics. Until FDA approval, this unit can only be used when the room is unoccupied. Unlike traditional UV-C, the unit’s wavelength matches the resonant molecular (peptide and disulfide) bonds frequencies on the outside of all pathogens. Bacteria, virus, and spores literally explode due to higher Far-UV photon energy. The lamps contain no mercury or electrodes, have very long lamp-life, and produce no ozone. Also, the product will not damage rubber or plastics, or even penetrate skin. Can UV Light Fight the Spread of Influenza? The New Columbia University Study again confirming the effectiveness and safety parameters of our patented wavelength (222nm) referred to by Columbia as Far-UVC. These results confirm studies that we have been doing for the last 12 years. We have patented 222nm for air, liquid and surface disinfection. Our patents cover all forms of skin and eye disinfection. We are in the process of getting FDA approval for a number of applications. We call this wavelength Far-UV Sterilray. It’s estimated businesses lose $159 billion each year in lost production and sick leave. But with the proper Far-UV Sterilray devices that we have now available, you can help protect hospitals biggest assets and their patients. I’d like to invite you to visit our website (www.sterilray.com) and review all of our solution options that could help NOW during this Flu season. Our patented Far-UV wavelength will be taking over the disinfecting industry. We are more effective, we are faster, we are safer. Our Autonomous Disinfection Robot will change the way operating rooms are disinfected. Far-UV Sterilray technology can disinfect conveyor belts, production lines, the air in HVAC systems in the largest buildings and in Residential homes. We can disinfect the air and remove the odor in Cannabis grows. Other applications include restaurants, trains, planes, and autonomous vehicles. The applications for dry, chemical-free disinfection are endless. Contact us to use Far-UV Sterilray lamps in your product or facility. We have agreements with Hepacart and Kaylx Scientific to sell our products and put our lamps into their products. Visit their websites about our technology and incorporating Far-UV Sterilray lamps into their products. We supplied Far-UV Sterilray lamps for Boeing for their self-cleaning lavatory project. High Energy Ozone LLC supplied Far-UV Sterilray™ lamps to Boeing for Boeing’s lavatory mockup and lamp performance testing. Heo3 specializes in Far-UV Sterilray™ Technology and High Energy Ozone generators. Heo3 is seeking to partner with companies that have a need for dry, chemical free disinfection.All patents are currently owned by S. Edward Neister, Pathogen Path Consultants LLC (PPC) and as the sole inventor, Neister has granted to High Energy Ozone LLC a royalty-free license to make, use, sell, offer to sell, develop, and improve on, any of the technologies contained within such patents. PPC will file two or more additional patents on Far-UV Sterilray™ device variations in 2016.